The 5-door Honda Civic Shuttle (previously called the Wagovan) was a crossover before there was such a thing as crossovers, but it competed with Toyota's Tercel Wagon and Subaru's Wagon thing in the small 4X4 wagon segment. 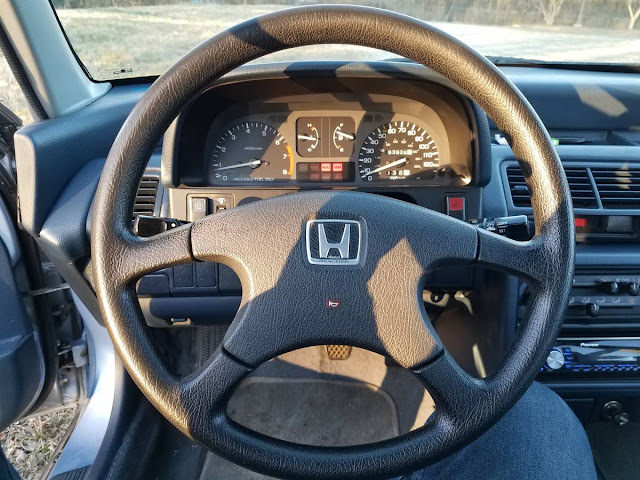 Power in the Civic Shuttle came from a 109 horsepower 1.6 liter 4-banger that was mated to a 6 (YES SIX) speed manual gearbox that featured a stump-pulling first gear good for about 2.1 mph at redline. 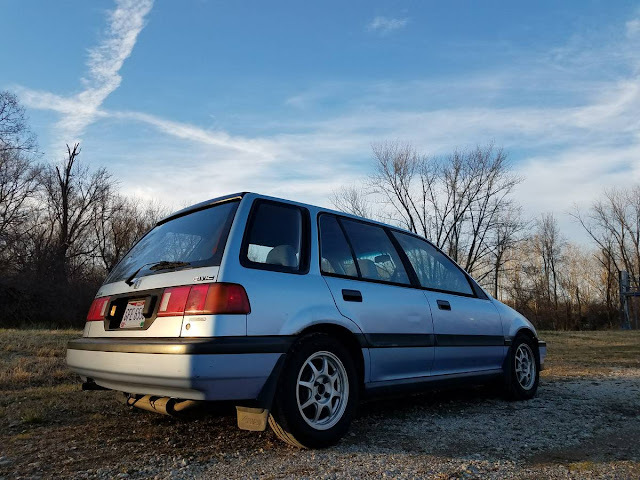 Find this 1991 Honda Civic Wagon RT4WD offered for $5500 in Cincinnati, OH via craigslist. Tip from Rock On! Bought new in Boulder, Colorado at Summit motors on 10/24/1990, spent its entire life in Colorado until this past November. I flew out to Denver, CO, met the P.O. in a gas station parking lot and proceeded to make the 1400 drive home in 1 1/2 days! averaged 30-32 miles per gallon on the highway, and for being 27 years old,i thought I may have to add fluids/check periodically..... but I never had to add any fluids, so the motor is strong, does leak or burn any oil!!.. cruised 65-70 the whole way home. Right before the long drive, the P.O. Installed a new exedy OEM clutch (192k), prior to this the timing belt was replaced at 190k per service manuals standards (80-90k or 7 years). Front drive shafts replaced due to CV boots being torn, front brakes and rotors replaced. The previous owner took a trip from Denver to Indianapolis, just a month prior to me purchasing it, so a lot of preventative maintenance was preformed to ensure a safe, problem free ride. I have a Shop manual for the civic to go along with it, clean Ohio title with a Colorado Emissions test done right before I brought it home, so she good to go read for being a daily driver or a country cruiser! I am regretfully selling due to recently being offered a company vehicle, id rather not see her sit and maybe get driven once a week, so my loss is your gain! This is the second Wago Ive owned, first one rusted out completely and I sold for parts, searched for about 4 years coast to coast and down south for a MANUAL, RT4WD, with very little to no rust, as I said before only selling to not have her sit for periods at a time, would rather see it go to someone who will get good use out of it and keep it in its original state! 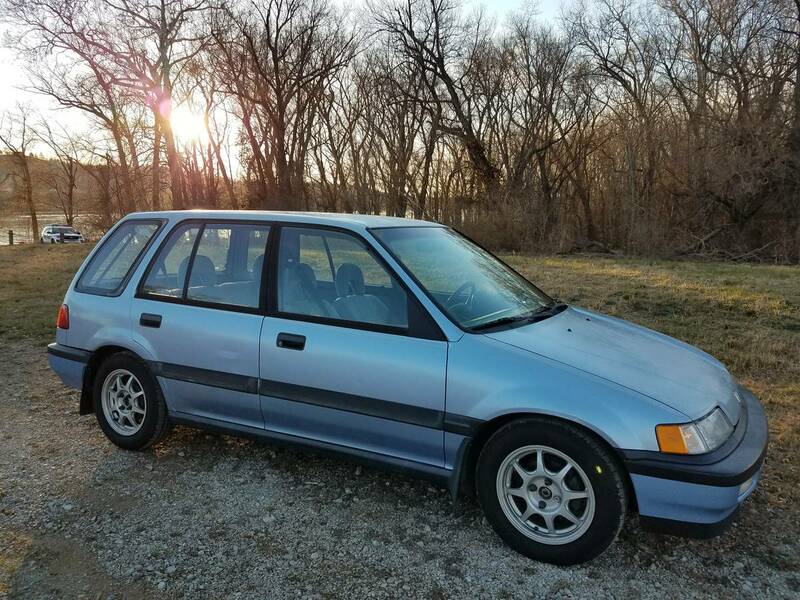 Selling for $5500 or best offer, look around, search and see whats out there, this is a rare Honda that will soon become extinct! EF civics are my jam! The want on this is almost painful.